Since many of you enjoyed a holiday yesterday, I trust that you had a safe trip back home and enjoyed this long weekend cherishing the memories of our great time in Spain. I received so much positive feedback and therefore, I would like to underline that also this year’s success of our annual event is due to a fantastic team work. Therefore, I would like to sincerely thank our fabulous co-organisers, Ghada, Ana, Pietro, Panos from the World Bank Group and likewise Matt, Hourn from The SME Finance Forum and all their respective supporting colleagues as well as our marvellous hosts especially the President of the Confederation of Spanish Mutual Guarantee Societies (CESGAR) José Rolando together with Pedro, Marta, Jaime, Sonia, Ana and José Maria for having made us feel at home. It was a big joy organising and running this event with all of you and simply moving to see how much time and efforts you invested – muchísimas gracias! In addition, I very warmly thank particularly our President Bernhard Sagmeister but also his excellent team from aws for their strong support to the annual event and on this occasion likewise in general for their outstanding commitment to our association. Ganz herzlichen Dank an Euch alle! Given that AECM celebrated its 25th anniversary, let me also extend my thanks to our former Presidents to Pablo, Thomas, Guido, Hans-Herbert, José Fernando and in loving memory to Italo for having founded and developed our association. Without you, AECM would definitely not be standing where it does today – muchísimas gracias, merci beaucoup, bedankt, herzlichen Dank, muito obrigada, grazie mille! 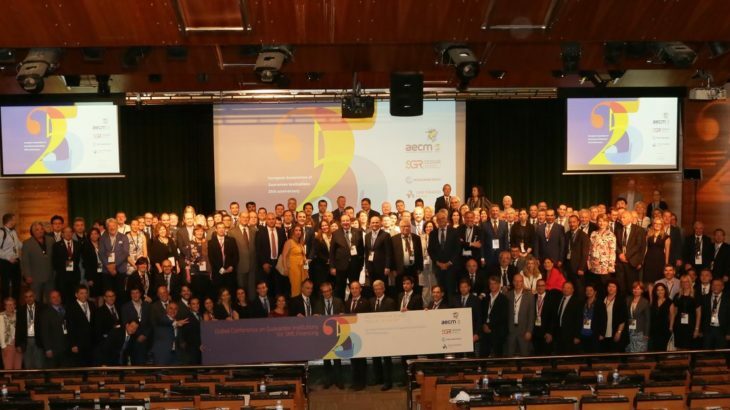 Of course our Presidents have always been strongly supported by all the eminent members of the Board of Directors who do so much for AECM – many, many thanks to all of you, too! Furthermore, I would like to give particular thanks to my dear colleagues Eleonora and Marc including of course also Jean-Louis. It is a privilege and great joy working with you not only on a professional level but also on a private one – a super big thank you to all of you! And last but absolutely not least my gratitude to all of you including and warmly welcoming again our new member SBCI from Ireland. It is amazing to see with how much dedication you contribute so strongly not only to this annual event but in general to our / to your association thereby creating an atmosphere which I perceive as quite unique.